„The Computer Vision Lab (CVL) was formed in 2010 from the Pattern Recognition and Image Processing Group (PRIP). It is continuing to play an important role in various national and international activities. The Lab coordinates an ERASMUS-Program and has organized various international conferences (DAGM 1994, DAGM 2005, ICPR 1996, CAIP 2007, VSMM2009). The research activities of the group include theoretical and application oriented research. CVL provides vast experience in running and leading national as well as European projects. 3-D Computer Vision; Neural Networks and Adaptive Methods; Image Sequence Analysis. Multi-Spectral Imaging. Take the subway U1 to the stop “Taubstummengasse”. 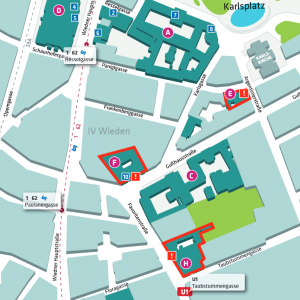 Use the exit “Taubstummengasse”, walk along the “Favoritenstraße” in the direction “Karlsplatz” (same direction as the exit), pass the pharmacy until you reach the entrance of Favoritenstr. 11 (glas door). Then walk straight into the building, make a left and a right and you are in front of the elevator and the stair Stiege 3. Take the elevator (or the stairs) to the 4th floor. Leave the elevator, and make a right to the corridor on the right. Go into the corridor and make a right at the end. Go to the end of the corridor, you find the secretary at the right side of the corridor, last door.